‘To and fro in my dreams I go’ An exhibition of paintings by Esther O’Kelly at The Pigyard Gallery Wexford. This exhibition is a collection of paintings about our fragile human state and how we experience life, love and loss. The work is about family, friends and influences as much as it is about the artist herself. We see her making connections from the outset, as we travel back through fragments of her past, The journey beautifully non-linear, an inexplicable series of dreamlike states that gracefully ebb and flow through the parameters of the Artists consciousness. The paintings act as emotional triggers, visual springboards into her past. Impressions of place are a main feature of the work, remembering childhood laughs, larks and loves with nostalgia. The paintings are synonymous with recollection, a series of beautifully simplistic compositions that signify youthful joy and glee. 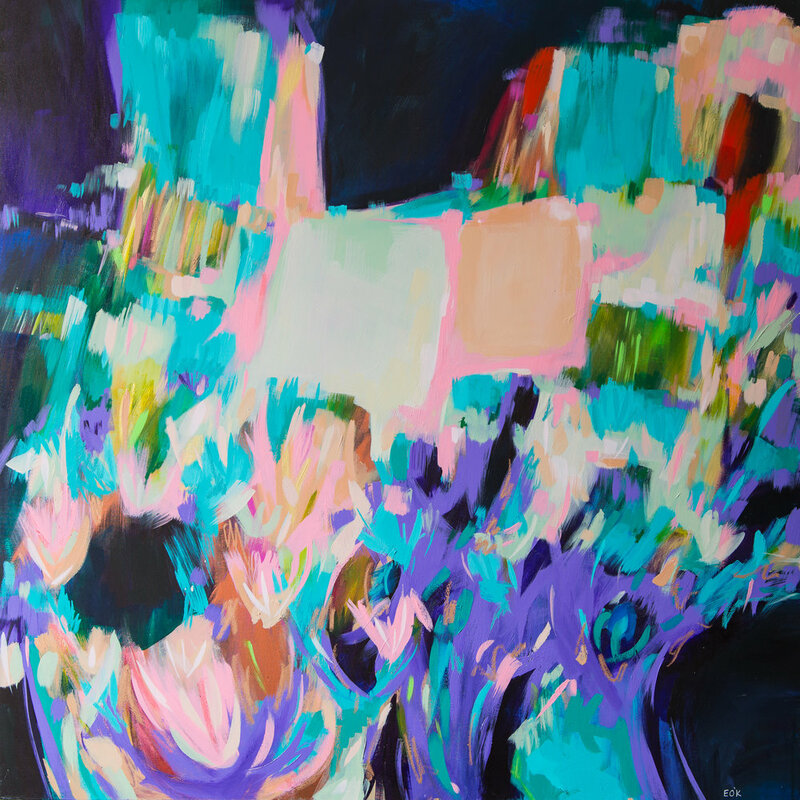 Esther’s work is romantic and expressively coloured, with forms that seek to capture a memory and evoke a sense of place. The Irish landscape with its mixture of buildings nestling in dramatic rural settings have a strong presence in her work. They may begin as depictions of a place from a memory but during the painting process they take on a life of their own – houses and walkways are painted over but the imprint remains visible, creating an archaeology beneath the painted surface. Colour is an integral element – fine layers of paint are built up and stripped away creating delicate colour passages and textures reminiscent of stone and peeling paint. ‘To and fro in my dreams I go’ oozes with powerful memories of a simplistic upbringing, complete with family, friends, love and life in all its magnificent glory. Esther’s solos show opens June 29th for 3 weeks in The Pigyard Gallery Wexford.